Three years ago, Disney spent $4 billion in its purchase of Star Wars from Lucasfilms. Now, with the seventh film in franchise history set to release on December 18, the Company is hoping for big numbers at the box office. That's partly why this time around, Star Wars marketing and merchandising efforts are including women and girls in ways they haven't before. Kay Jewelers has rolled out 'Dark' and 'Light Side' jewelry collections for instance, and Daisy Ridley, new star of the "Force Awakens," is on the cover of several major women's magazines this month. I asked Sarah Dempster, long-time fan and Star Wars blogger at Eleven-ThirtyEight.com (so named in honor of George Lucas's early science fiction film THX 1138) to weigh in. What do you make of the franchise reaching out to women specifically, a first in the (four decade) history of Star Wars films? For a long time I think there was this idea that science fiction and fantasy were a "boy things" but anyone who's around fandom spaces or who's been to a convention can see that's not the case. And it's not like this is a recent thing either. Whether it's Star Wars or Star Trek or Lord of the Rings or video games or superheroes, women and girls have been there since the beginning. It can be frustrating, because so often we're asked to "prove" our fannishness. By knowing rare trivia or being able to name every Star Wars book in chronological order, or whatnot. I've rarely ever seen male fans subjected to the same sort of interrogation. But fortunately, that's starting to change. Ashley Eckstein, the voice actress for Ahsoka Tano in The Clones Wars and Rebels, actually started a fangirl clothing company called Her Universe several years ago specifically because there was basically nothing out there in the way of geeky merchandise for women and girls. She's been a positive force for fangirls for quite some time. And at SWCA, Kathleen Kennedy made a point of saying that they want to include more female characters in the franchise. All this focus on female fans is great, because it's chipping away at that idea that geeky things are for guys. And it's not just about the merchandise. It's emphasizing that women are fans of Star Wars too, and should be able to see themselves as heroes and villains onscreen just like men do. Everyone should have the chance to see themselves in a galaxy far, far away. Tell us about yourself. 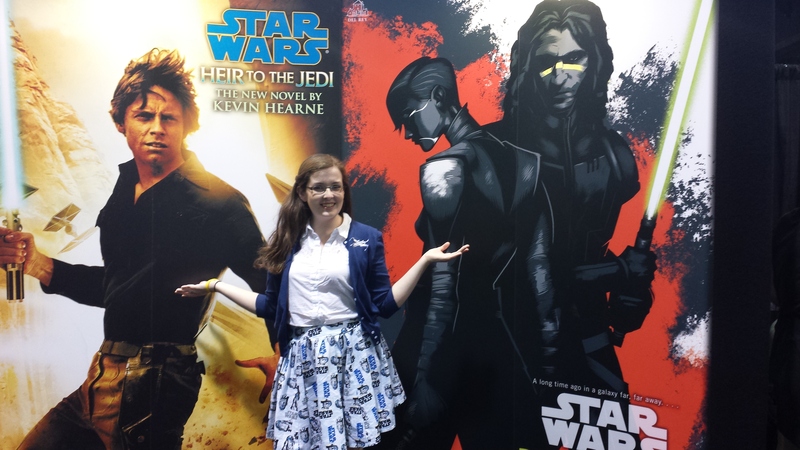 How did you become a Star Wars blogger? I'd been in various online fandoms since middle school, but got involved in the online Star Wars fandom when I was in college and started using Twitter more extensively. I also started going to Dragon Con (a fantasy/sci-fi convention held in Atlanta, where Dempster lives) and met several people there whom I now consider close friends. This past April I traveled to Anaheim for Star Wars Celebration, which is the big official Star Wars convention that's hosted in a different city each year. I think that was what cemented my transition to "super-fan," because when you're surrounded by people who spend their free time discussing the finer points of Star Wars lore, it's hard not to be! One person I met at SWCA, who has since become a very good friend, was Jay (@admiraljello), one of the staff writers for Eleven-ThirtyEight. Last August he reached out and asked if I'd like to become a regular contributor for the site. It's a fantastic group of people who write wonderfully smart and thoughtful pieces, so I'm constantly being challenged to push myself as a writer. My father first showed my sister and me the original trilogy movies when we were in preschool, which would've been back in 1995 or 1996. I was running around the playground pretending to be Luke Skywalker or Princess Leia, drawing Star Wars characters on my school folders, the whole shebang. And then, of course, the prequel movies started coming out so that just added fuel to the fire. Both my sister and I dressed up as Queen Amidala for Halloween the year Episode I came out and we'd eagerly reenact the movie in our backyard with the other neighborhood children. My father always says that he showed my sister and me the movies so that we would become fans and then he would have an excuse to go see the prequel movies when they eventually were released. He definitely didn't predict that I would become the super-fan I am today. Star Wars releases nationally on December 18.